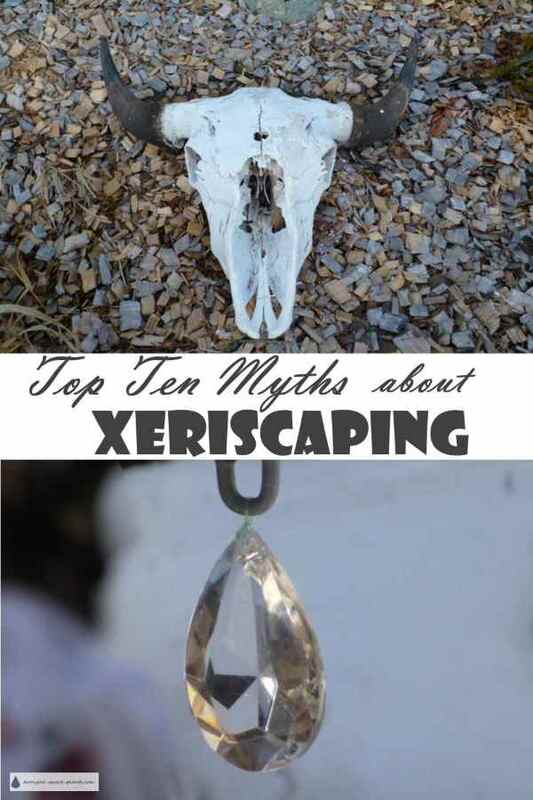 Top Ten Myths about Xeriscaping - what is it, and how do I do it? Xeriscaping is such a new style of gardening that there are a lot of unfounded rumors and myths about it. I aim to dispel these once and for all. Whether you're an old hand at growing well suited plants, in properly prepared beds, and carefully thought out strategies for making water go a lot further, or you're being dragged kicking and screaming, forced into xeriscaping by the high cost of municipal water, you're not alone. These myths illustrate some of the most common misconceptions about using these methods to garden. Choosing low water requiring plants, combining them in zones to make them easier to irrigate, and mulching with lava rock or other mineral mulches to prevent moisture loss and weed growth are only a few of the sneaky ways to get a beautiful garden without water. 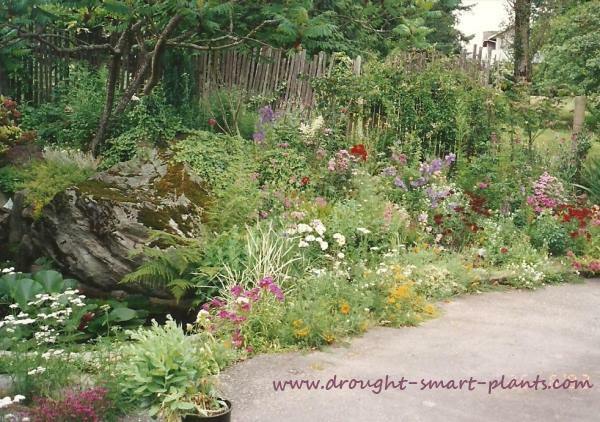 Join in the fun; do you have some preconceived notions about dry gardening? Check them at the door; you won't need them here. A moonscape implies an area that is dry and dusty, with no life at all. Xeriscaped gardens are alive with small creatures and insects, lizards and small mammals, spiders and a myriad of other life forms to watch. Each tiny microcosm in the cracks and crannies of the rocks is a marvel, an intricate web of perfectly adapted plants, creatures and rocks to protect them and nurture them. The flowers that thrive in xeriscaped gardens are hardy and drought tolerant - and produce lots of nectar to attract insects. With a wealth of textures in mulch, interesting rocks, driftwood, garden statues and sculpture, as well as the interesting plants in colorful combinations, I doubt if this will ever be a concern. Textures become more important, especially in the winter. This is not strictly true; the maintenance is less, as there is no lawn to mow, no shrubs to prune, no fertilizer to spread, and virtually no weeding. Chemicals are kept to a minimum; with the plants grouped in communities of similar needs and requirements, there's no need. Plants are chosen for their toughness of character, ease of growth, and, resistance to pests. Some dividing of perennials, removing or spacing dominant species as they grow, and refurbishing the mulch are some of the maintenance tasks that might occur in your xeriscaping. The watering part of maintenance is where you will save time and money; most of the plants you choose for your xeriscape design will be non-thirsty types; even if they do need some water to get established, as time goes on, you'll find that their roots stretch deep into the subsoil, under rocks and seek out moisture wherever it collects. 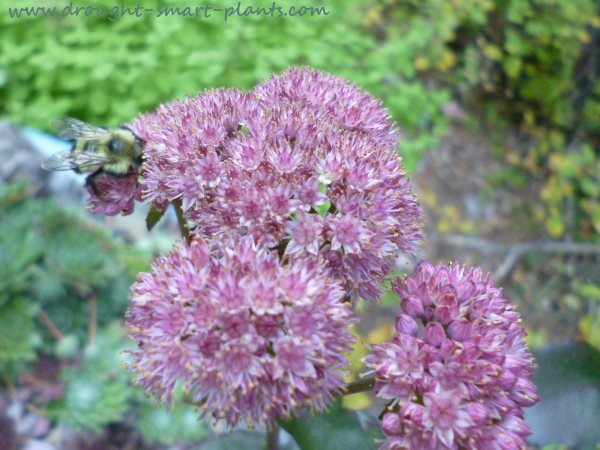 They will thrive on much less water than the typical garden perennials, shrubs and groundcovers. In many areas, this is already in place; one new subdivision in my area has several covenants; these are rules that must be followed by the owners of the houses. Some of these are that the roof lines must consist of several peaks and valleys to provide interest; the fencing can only be four feet high, and only in the back yard; they can't have a clothesline and the front yard must be xeriscaped, although they also require one tree per garden. There were no specifications as to the genus or species of the tree, but one hopes that they have some idea of drought tolerant trees that would blend well with the rest of the xeriscaping. There are ways to gently encourage a change in thinking with your HOA. 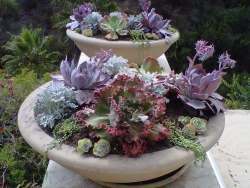 More and more designers and architects are specifying drought tolerant plants for their designs; up until recently, there was no categorization of plants as low water so for many designers who didn't know much about the plants, there was no way for them to choose the right plants that didn't require much watering. Now, with water restrictions in many places, it's becoming much more common place to see xeriscaping, especially in public areas, condominium complexes and recreation centers. Money is better spent on services and amenities for people, rather than wasting it on upkeep of extensive lawns and gardens that are so resource intensive. Rocks and boulders definitely add structure and height to any garden, but they are not an essential part of a xeriscape. Xeriscaping depends on the principles of design, just as much as any other type of gardening; balance, harmony and texture can be brought in by using smaller or taller plants in varying amounts, berms will add height, swales give the impression of a creekbed, all using the drought tolerant plants which are the mainstay of the method. I've seen incredible xeriscaped gardens that use concrete blocks for a very linear looking design, softened by the plants spilling over the edges; but no rocks. Of course, if you're lucky enough to have some nice flat ones, by all means utilize them. 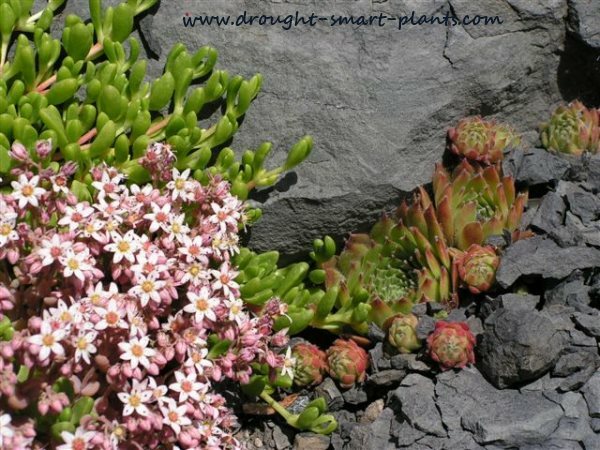 Many plants thrive in dry conditions; hardy succulents such as Sedum and Sempervivum, many perennials, especially those with grey or silver foliage and extensive tap roots are perfectly content in a xeriscaped landscape. Grasses, especially those that thrive in droughty conditions are renowned for their ability to flourish and form large colonies. With Xeriscaping, it's all in the planning and the actual landscaping; after that, nature will guide you; if the plants are all dying, then it's up to you to do something, but generally, if you follow a few common sense rules (like planting the right plants for your soil and climate) once they get established, they take care of themselves. Allowing them to go dormant during very challenging times, and resisting the urge to pour water on them is all in the mindset. 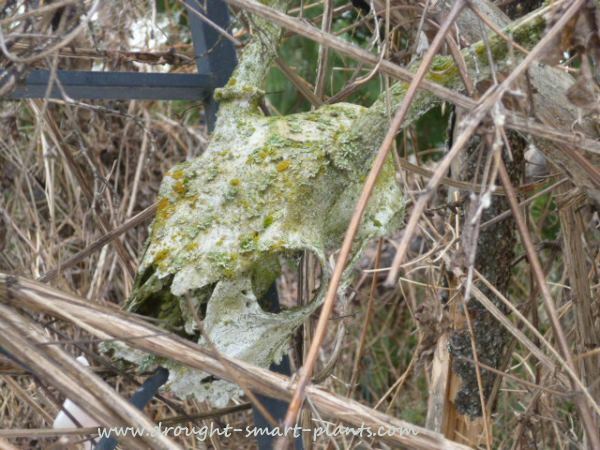 Cactus plants are a great xeriscape plant, but not the only ones; skulls are optional. For a western desert look, you can use driftwood and rocks tastefully arranged to look like a dry arroyo, planted with many of the ephemeral types of plants in a desert. These are pretty much dormant until it rains, and then the dry and lifeless desert explodes into blooming life. Recently, many schools and universities have started using xeriscaping on their campus grounds. All indications are that there will soon be a lot of new information coming out by the very people who are being exposed to it during their formative years; if they haven't noticed how beautiful and low maintenance the grounds are, it's because their minds are chock full of other important information.